As part of a sales team, you don’t get paid to fiddle around with the CRM. You get paid to close deals. But that can make work stressful for everyone, especially when just keeping the CRM up to date can feel like a full-time job. It’s time to put an end to data entry, concentrate on running your sales operations more efficiently, and win bigger deals. So, how do you start doing that? At Process Street, we’re fanatics when it comes to automation, workflows, and systems. That’s because we know that the foundation of an efficient business — one with lower running costs and higher output — is a solid set of processes. That’s not just for things like finance and HR. It comes down to the nuts and bolts of how you and the rest of the sales team uses your CRMs. In this article, I’m going to show you how to spend less time searching, updating, and making sense of the disorganized data inside your CRM. The reason you might want to do this is so you can bake processes into your sales team’s workflows. Processes are especially important for outbound sales because there’s so much to remember and track, and it also helps you train new SDRs with the ‘one best way‘ to do their job. You can use the method in the video below with any kind of checklist, but we recommend a client onboarding checklist or a BANT sales qualification checklist. Prefer to do this same thing in Close.io? Scroll down; we have a video on that too. Staying on top of communications with hundreds of leads can be hard, even with a good CRM. Luckily, Agile CRM has a full workflow layer for qualifying and communicating with leads based on their activity. 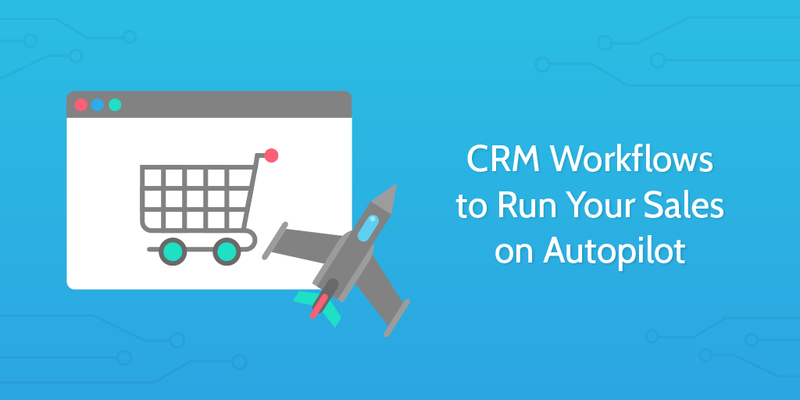 Also, if you run your marketing automation with Agile CRM, you’ll get your leads scored and updated automatically inside the CRM based on how they’ve interacted with you in the past. Unlike some sales and marketing automation solutions, Agile CRM is free for 5,000 emails and 10 users, or starts from $8.99 / user / month if you want to take it further. To put it simply, the BANT sales qualification process is a system you can use to decide which leads are worth chasing, and which aren’t worth your time. It stands for Budget, Authority, Need, and Timeframe: four points you need to evaluate for each lead. It sounds all well and good, but keeping track of your leads in relation to their BANT score isn’t easy without the right tools — especially when you start to get a lot of requests coming in. In the video below, we explain how you can integrate Process Street’s BANT qualification process into Close.io. It’s a way to get not just freeform notes you have to manually process, but structured data on your leads. That helps you do analysis if you export or look at the process’ overview. CRMs will each have their own unique ways of adding leads. But sometimes, these methods don’t gel with the way you actually do things. For example, you might use forms to capture leads but then have to go and add all of those leads into your CRM manually. That’s a massive waste of time and can be averted with a little automation. Whichever way suits you best, rest assured you’re taking one step away from spending your days up-keeping a CRM, and one step towards making more sales with all that free time. Unfortunately, 100% of customer interactions don’t happen inside your CRM. And new leads aren’t always going to be found inside your CRM — they could come in through support channels, which means you need to set up a way to easily transfer them between your two systems and keep the records updated. 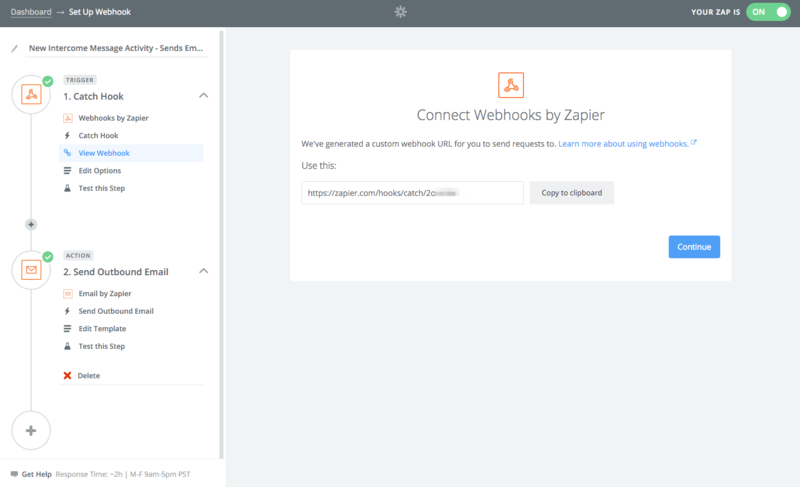 First, create a webhook in Zapier. Then, create a webhook in Intercom. Next, you need to configure the rest of the zap. Click here to see a full size image of the configuration shown below. Does your team use Slack? If so, there are tons of things you can do with it that help keep your sales team up to date. You can send activity to a Slack channel from most CRMs, including Salesforce, Close.io, and Base CRM. If you’re a Pipedrive user, however, it’s your lucky day. See Pipedrive’s quick-start guide for help getting it set up. When I’m on support duty, I often find that free accounts are curious about our business plan. I’m not sales staff, so what do I do in this case? Well, instead of looping the sales rep into the conversation, I can simply tag the message and have it copied into our CRM as a task for the sales team, along with the customer’s data. This is possible with Zapier because the help desk tools that integrate with it all have the right trigger (e.g. message/user tagged). 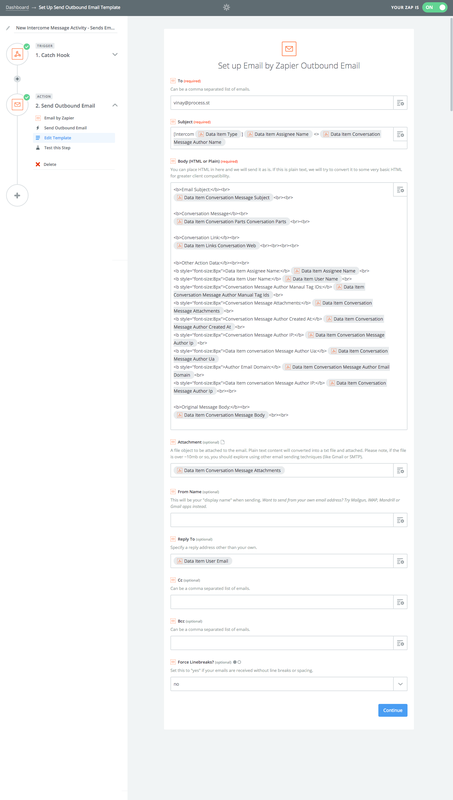 At Process Street, we use Intercom’s ‘New Tag on User’ trigger, linked to the Close.io action ‘Create task’, but that takes quite a bit of custom set-up that’s too complicated to go into here. Clearbit provides huge amounts of data to sales teams that help demystify the leads they get. It provides information like company size, location, funds raised, tech used, and more. All in the name of giving your sales team a better chance at making a connection. With Clearbit’s Salesforce, Marketo, Segment, and Zapier integrations, it’s highly likely you’re unable to integrate with it (especially since almost every CRM on the market integrates with Zapier). By connecting Clearbit to Slack, you can push new lead data to your sales Slack channel and announce new high-ticket signups to alert your sales team it’s time to get in touch. Click here to learn more about Clearbit’s Slack integration. Pricing starts from $99/month for 2,500 API calls. Interested in more workflows and automation? If you’re anything like us, you’ll jump at the chance to automate work and help your team work more efficiently. We have hundreds of integrations set up, and have some CRM-specific integrations you can use here. More generally, download our free ebook — The Ultimate Guide to Business Process Automation — to start automating everything including social media marketing, accounting, and emails.